Three new water masers have been discovered in the Milky Way, including what could be one of the fastest ever found — reaching speeds of up to 350 km per second –- and a rare ‘water fountain,' a special class of ‘masers’ -– large microwave lasers caused by high-mass dying stars or high-mass star formation regions. The high mass source spews out material including clouds of water that can travel at a couple of hundred kilomers per second. The term ‘maser’ originated as an acronym of Microwave Amplification by Stimulated Emission of Radiation. Masers work the same way as lasers except they emit microwaves instead of visible light. 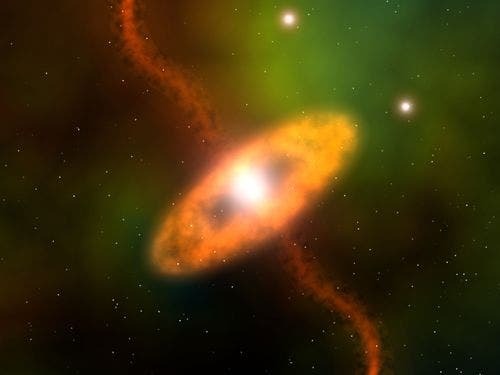 Water molecules in High Mass Star-forming Regions (HMSR) and around dying stars absorb energy from their surroundings and re-emit it as radiation in the microwave frequency range. Using the Australian Telescope Compact Array near Narrabri in New South Wales, Glen Rees from the Commonwealth Scientific and Industrial Research Organisation (CSIRO), found the three masers using data collected by the H2O Southern Galactic Plane Survey (HOPS) investigated the characteristics of three unique water masers located in the Milky Way by searching for a particular radiation frequency in the microwave region that is characteristic of water masers. “Water masers emit at 22 Giga-Hertz so we conducted our observations at this frequency,” said Rees. One of the water masers Rees discovered was found around a post-Asymptotic Giant Branch (AGB) star –- a star nearing the end of its life — and falls under the ‘water fountain’ classification for water masers, which occurs when a dying star spurts out jets of water molecule emission as it transitions into the next stage of its life. Only 12 water fountains have ever been detected so far. These stellar ‘water fountains’ can help scientists work out how spherical AGB stars evolve into planetary nebulae — a bright, colourful shell of gas and dust surrounding a star in the last stages of life, which display a range of shapes and sizes. “Exactly how high-mass stars form is still not well understood and water masers can give a valuable insight into the processes involved,” said Rees. Image: Artist's conception of the aging star, W43A, surrounded by a disk of material and a water maser.